After my conversion, my pillow soaked up many tears—tears of joy at first, but then tears of sorrow. Before I was saved, I was blinded by my own self-righteousness that told me I was fully in the right in the ways I wounded others. Though I never physically laid a hand on anyone, I knew how to leave a verbal bruise. I justified my words by convincing myself they were for my own protection. I hurt my parents, my boyfriend, and my friends under the self-proclaimed cause of “self-care.” Every morning I seemed to wake with a further self-awareness of what a horrible person I was. Is the idea of self-forgiveness in the Bible? Which verse calls us to forgive ourselves? Though the Bible discusses both guilt and forgiveness, it never once mentions forgiving ourselves. We are called to forgive others and seek their forgiveness. We are called to cry out for forgiveness from God. But we are never told we need to forgive ourselves—and it’s not because the command was forgotten. Self-forgiveness says that we have the authority to choose if our sins are forgivable or not. But that’s not the case. Rather, Jesus paid the full price for your sins when He died on the cross and rose again. Jesus didn’t pay a part of the price and then ask you to finish it off. He fully atoned for each of your sins and bore God’s wrath that you deserved because of them. If you can free yourself from guilt by forgiving yourself, then you are doing a work you were not called to do. Jesus says that no work is sufficient to take away your guilt, only His perfect sacrifice (Eph. 2:8–9). He was crushed, pierced, and chastised for our sins. He carried each of our sins and sorrows. If you are truly saved, there is nothing you can do that His blood won’t cover. Though you went astray and rebelled against God in your past, He paid the price for your sins even still, knowing all the sins you would commit and did commit. Friend, striving for self-forgiveness is a hopeless task. It will never bring you true relief from your guilt. Christ alone is sufficient to forgive your sins. So seek forgiveness from Him—repent of and confess your sins, and He will be faithful to forgive (1 John 1:8–9). But the guilt is still there. Even after you have confessed your sins to God, you have confessed to those you hurt, and you have repented—yet the guilt still lays heavy on your heart. What do you do with it? First, know this is false guilt. If you have sought the forgiveness of God and others and repented, then you have no reason to be guilty. And you, who were dead in your trespasses and the uncircumcision of your flesh, God made alive together with him, having forgiven us all our trespasses, by canceling the record of debt that stood against us with its legal demands. This he set aside, nailing it to the cross (Col. 2:13–14). When guilt says you are not loved by God because of your sin, remind yourself that you were saved not by merit, but by grace (Eph. 2:8–9). When your heart tries to convince you that you need to pay some kind of penalty for your sins, remind yourself that Christ has paid the price in full (Rev. 5:9–10). When your mind says that you are not worthy of God’s forgiveness, remind yourself that you were never worthy, but God extended you grace (Eph. 1:7–10). Your heart is deceitful (Jer. 17:9), but you don’t need to listen to its deceit. Let God’s truth fill your mind (Phil. 4:8). This may mean memorizing verses that remind you of the gospel and the forgiveness you have in Christ. Or maybe you will need to keep a handwritten verse in your pocket. Maybe you will need to cover your home in notes with Bible verses. Whatever it may be, preach the gospel to your weary heart. Friend, I don’t want to condemn you or shame you for wanting to forgive yourself. I sought this once, too. What I do want is to free you from the hopeless chase of self-forgiveness. 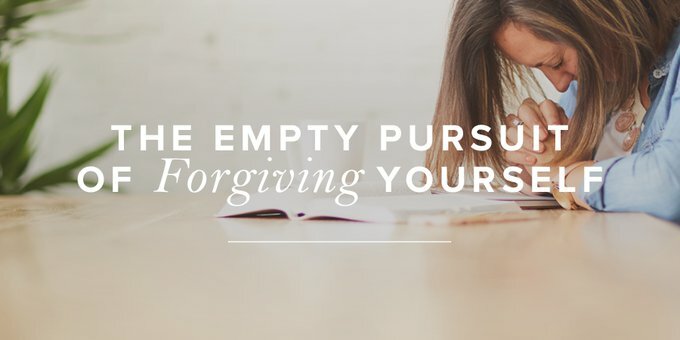 Self-forgiveness provides no hope, no healing, and no help. But trusting alone in Christ’s forgiveness, in His atonement, will always bring true freedom and joy.